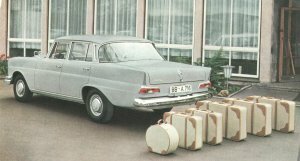 The 220, 220S and 220SE (or W111) directly replaced the old six cylinder Ponton A saloons, although the two door Ponton A models remained in production until November 1960, the four cylinder Ponton A cars stayed in production until 1961 when they were replaced by new four cylinder W110 cars (see chapter 4) 1961: The 190 and 190D ). All three models had a six-cylinder engine with the same volume although they differed in horsepower output. All cars had a manual transmission as standard but in the autumn of 1961, Mercedes increased the 220's appeal by offering customers the option of their own four-speed automatic transmission with fluid coupling. This gave the car and additional prestige appeal in the days when in Europe automatic gearboxes were associated with luxury cars. Before this option, customers could choose a Hydrak clutch option which meant normal gearchanging by hand but without a clutch. The Hydrak clutch was a legacy from the Ponton A models but was never very successful with the Heckflossen. Hydrak drivers sometimes 'misused' the clutch and forget to remove their foot from the accelerator when changing gears. When it concerns the exterior and interior of these cars, the 220 differs in a few things from the 220S and the 220SE. The 220S and SE look, apart from the badge, completely the same from the outside. The 220 model is a bit of an outsider on looks. All 220 models share the same front but the rear of the 220 looks very much like the later introduced 190 and 190D (see chapter 4) 1961: The 190 and 190D ). The later introduced 300SE models (see chapter 5) 1961: The 300SE ) look like a 220S or SE with additional chrome. Of the second generation models only the 230S looks exactly like its predeseccor: the 220S. The successors of the 190 models, the 200 models, received a small face-lift. The 220 was replaced by the 230 but this new model looks exactly the same as the 200 models (see chapter 7) 1965: The Second Generation: 200, 200D, 230 and 230S ). One of the many differences between the 220 and its pricier sisters were the wheels. On the 220, the hubcaps were exactly the same as the hubcaps you would find on a 190. Simple wheels with 4 openings and placed on that, a hubcap similar to those found on the S and SE models. The wheels and hubcaps were always painted in the same colour as the body, if the car had a two-tone colour scheme then the hubcap was painted in the colour of the upper body part. The wheels of a 220S and SE received a chrome rim with 12 holes, on early pictures you can find wheels that have 8 holes. Again the hubcaps were painted in the body colour or, in the case of a two-tone colour, painted in the upper body colour. At the front, the traditional Mercedes-Benz grille was still dominant, although it was much lower than on the previous Ponton models and was neatly flanked by the streamlined 'Lichteinheiten' with built-in fog-lights. These 'Lichteinheiten' first appeared on the 300SL roadster of 1957. Cars destined for America had vertically paired 'sealed-beam' headlights (here shown on the right). Another difference between the 220 and the S and SE models was the fact that a 220 only had one horizontal chrome strip between the grille and the headlights wereas the S and SE models had two. Mercedes decided in 1963 to give all the sedans of that time a small face-lift, some minor details on the cars give away their 'before' and 'after' look. One of those details was that the rearview mirror moved from its place on the front wing to a place nearer the driver on the front door. This was done so that adjusting the mirror could be easily done from sitting in the seat. Other significant changes were a different design for the foglights on the 190 models and a squared off horn ring on the steering wheel as opposed to a round one. The 220 models were quite richly decorated with chrome, on the right you can see the difference in the use of chrome between the 220 and the 190 models around the windows. The 190 models were spared of massive use of chrome and therefore looked less luxurious than the pricier models. This difference between the W111 and W110 models remained the same throughout their production time. A novelty item were the air-outlets (here shown on the left) on the C-pillar from which the air would flow out of the interior so that it could be refreshed. On the right you see how the air stream was directed inside the interior. The idea behind this was that the air flowed inside the interior via an air-intake mounted on the hood and would then be directed between the front windscreen and the passenger area. The air would then 'leave' the passenger compartment via the air-outlet. Not only were there significant differences in appearance between the 220 and the 190 models, the 220 also differed in appearance of the 220S and SE models because Mercedes believed that buyers wanted it to be obvious when they had paid the for one of the more upmarket cars. The cheaper 220 models had no chrome strips along the top of their rear fins, the more expensive 220S and SE did have that strip. Note that both models have a chrome strip on the vertical part of their 'fin'. Strangly enough, it was more costly to leave the chrome strip away. The chrome strip was placed where two body parts were welded together so models without the strip needed more hand-labour to smooth that welding joint. To simply put a chrome strip on that welding joint was easier and needed less hand-labour. Another significant difference in appearance between the 220 and 220S/SE models was the rear. Here you see that the rear of a 220 looks much simpler than the heavily chromed rear of a 220S/SE. The 220 has a single rear bumper where the S and SE models had a double bumper. The rear lights of a 220 were smaller and less rectangular off shape. The place of the two numberplate lights was also different. On the 220 intergrated in the bumper directly beneath the numberplate, on the S and SE models intergrated in the rear lights. When exactly these newer rear lights were introduced I don't know but it could well be possible that it occured in 1963, the year in which many other small things were changed or altered. The same change can be seen on the 190 models as well. Just as so much manufacturers were skimping on interior space to save weight, the interior of the Heckflosse was particularly spacious. Again there is a difference between the 220 and the 220S and SE models. The seats were large and comfortable, a little hard on first acquaintance but they gave a lot of support on long rides. The back rests of the front seats in the 220S and SE were adjustable, the 220 had fixed backrests unless to special order. Very early pictures of the 220S also show fixed backrests. Headrests were also on special order but not very popular and they are very sought after by owners today. There were three upholstery combinations: the standard woolclotch, MB-Tex vinyl that looked like leather and genuine leather. The genuine leather came with perforated panels which allowed the seats to 'breathe'. Two upholstered insets could be supplied as an extra; one to fit onto the oddments tray between the front seats and the other between the back rests, thus transforming the front seats into a bench seat. The inset between the back rests can be folded down to serve as a central armrest. An one piece bench seat could also be ordered. Here shown is the drivers door of a 220S or a 220SE. Again the 220 differed from the other models, these models didn't have the doorpockets (no. 5). Everything on the door was designed with safety in mind. The door-opener (no. 1) did not stick out, the knob to adjust the quarter lights (no. 2) was somewhat flexible. The window opener (no. 3) was also flexible and had padding. The armrest (no. 4) was also padded. The door on the front passengers side was the same except the armrest had an extra handle, like the one found on the rear doors. Not much shocking news for the rear: again we see the door opener (no. 1), different from the front was the astray (no. 2). Of course a window opener (no. 3) and an armrest (no. 4) could be found here aswell. On this point, the 220 models differed from the other models. Being somewhat less luxurious than the S and SE models, the 220 did not have the extended doorhandle on the armrests. Rear passengers could sit on a comfortable bench build for three, on the 220S and SE models they could enjoy the luxury of a fold down armrest in between them, the 220 had to do without this. Of course, 220 owners could order a central armrest at extra costs.